A beautifully presented introduction to the lives and works of 35 of the world’s most famous artists. Features Salvador Dali, Andy Warhol, Pablo Picasso, Renoir, Van Gogh, Leonardo da Vinci and Jan van Eyck, among others. Perfect for older children, this book provides fascinating information about the life and work of each artist. Includes reproductions of famous paintings, as well as photographs of the artists, their homes and their personal belongings. With internet links to websites to see more art works and find art activities. The thoughtful text brings a range of artists vividly to life while a timeline gives a sense of their development. A great introduction to a selection of well-known and much-loved artists. With timelines for each artist showing clearly the key highlights of their life, this is a wonderful compendium to enthuse budding artists into discovering more about some of the most famous artists who have gone before. 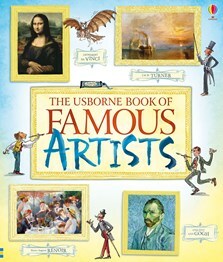 Usborne’s Book of Famous Artists is the best introduction a child could get to the lives and works of 35 great artists. Just the right amount of information to introduce children to great artists and their masterpieces. An excellent book for home or school. See the Internet links for this book.